Create a video of five minutes or less that teaches/explain how you make science, technology, engineering and/or math (STEM) a part of everyday life. Cash Money to be Won! 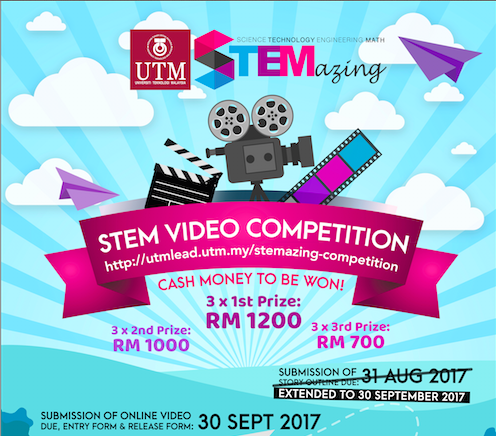 -entries should be submitted by uploading online (how to upload your video) for judging. –entry form please have the signature of your parent on the entry form unless you are over 18! Video STEM Winners are Here! Congratulations!!! Thank you everyone for your patience. Now we are proud to release the results! Thank you for your great videos, we enjoy them all! Video Synopsis: Matematik dan Sains bukanlah susah sebenarnya. Ia hanya perlu dipelajari dengan betul. Di dalam video ini, terdapat dua pelajar sekolah menengah menunjukkan contoh-contoh pengaplikasian ilmu Sains dan Matematik seperti Daya Geseran dan Pengiraan Kelajuan. Ianya sangat mudah. Video Synopsis: How do we apply Science, Technology, Engineering and Mathematics (STEM) in our daily lives? Let Roy, Abram Jen and his friends explain to you the uses of STEM! In this video, we show you how Impulsive Force, Rate of Reaction, Coordinate Geometry and Technology can be applied in our lives. We hope you enjoy and learn something from this video. Video Synopsis: Mengisahkan aqilah , pelajar baru yang baru berpindah ke sekolah STEM dan ester , pelajar STEM memperkenalkan pendidikan STEM di sekolah itu.